View the plethora of gifts from Dylan’s Candy Bar. Shown here are the Chocolate Lover’s Gift Basket, the Man Cave Gift Set, and the Hat Box Gift Basket. Lots to choose from including Dylan’s Signature gift bags, plush stuffed animals, and lots of chocolate covered everything. Harbor Sweets has been making handmade chocolates in Massachusetts since 1973. 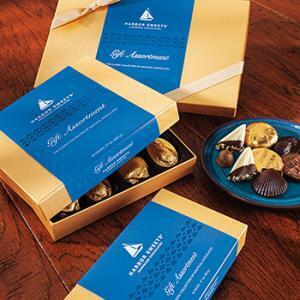 They have many gift options, including these gift boxes of Salted Chocolates, Dark Chocolates and Assorted Chocolates, which have some cute nautical, beach, and equestrian themed candies. Any chocolate lover would be ecstatic if something from Bake Me A Wish arrived on their doorstep! They have cakes, cheesecakes, cupcakes, brownies, quiches, pies, cookies and more. Corporate gifts too. Send a birthday cake, like the best-selling Chocolate Mousse Torte Cake, or the Incredible Bakery Tower, or the Jumbo Chocolate Lover’s Cupcakes, all shown here. For an ultra-luxury, yet still affordable gift, consider gifts from zChocolat. They have chocolate candies that go from rich and indulgent to cheerful and light. 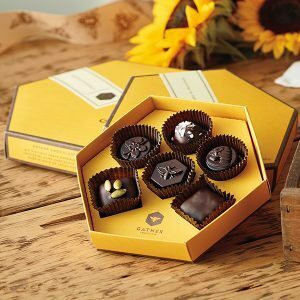 Their assortments make lovely stand-alone gifts or can be paired with beautiful zChocolat boxes. An ideal way to explore new flavors, stockpile old favorites, or introduce someone to fine French chocolate for the very first time. Pictured here are the chic and modern ZBox with chocolates, their 24 carat edible gold chocolates, and the luxury mahogany gift box with zChocolat chocolates. Check out all the chocolate candy gifts from Old Time Candy! Pictured above are the Decade Gift Box, their version of a Chocolate Lover’s Gift Box, and Cella’s Chocolate Covered Cherry Gift Box. You can also have personalized candy wrappers made, pick a bag of assorted candies, and view many more gifts. Astor’s family-owned chocolate company has some unique chocolate gifts – like these Moodibars Gift chocolates, Thank You Belgian Truffles, and Baby Girl or Baby Boy themed chocolates. All Astor chocolates are made in the USA. You can’t go wrong giving one of Ethel M Chocolates’ Best Selling Gifts. Here are three of them: Mixed Chocolate Pecan Brittle, their Signature Gift Crate, and the Ethel M Classic Collection. Ethel M Chocolates has been making chocolate treats for over 100 years.